I knew that the 65 degree weather we had last week was just a teaser. Yesterday we were supposed to get rain. Instead it snowed... all. day. long. Eventually, warm weather will come to stay and I'll be ready. I've got cilantro, sage, marjoram, and parsley growing in the window. I've never had much luck with herbs, so I'm very excited that they are doing so well. 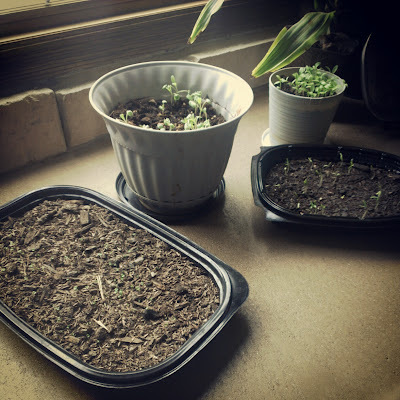 I have seeds for dill, lavender, chives, and basil waiting to be planted. In about a week I'll start separating individual plants into pots to allow them more room to grow. Some will be put in the vegetable garden, some in the herb garden, and some in pots on the porch. I think that I need a shelf in this window so I have room for my veggies! I finally named my mama chicken. Meet Velma. The name means 'strong protector' and I think it fits her perfectly. Velma and her chicks have been released into the general population. 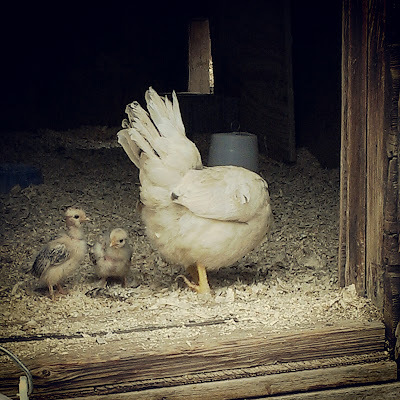 The other chickens don't seem to mind the little ones running around. It's fun to watch them follow the flock around the farmyard. One day I panicked because I couldn't find them, but they were with the others behind the barn scratching in the manure pile. They are extremely healthy and energetic and seem to be growing faster than the chicks I raised in a brooder. Pumba is also getting bigger. He has quite the personality and it will be hard to send him to butcher this fall. Despite the fact that he was escaping through the fence and wandering the countryside on a daily basis, he is growing on me. Now that his escape routes have been fixed, he likes to hang out in the yard. 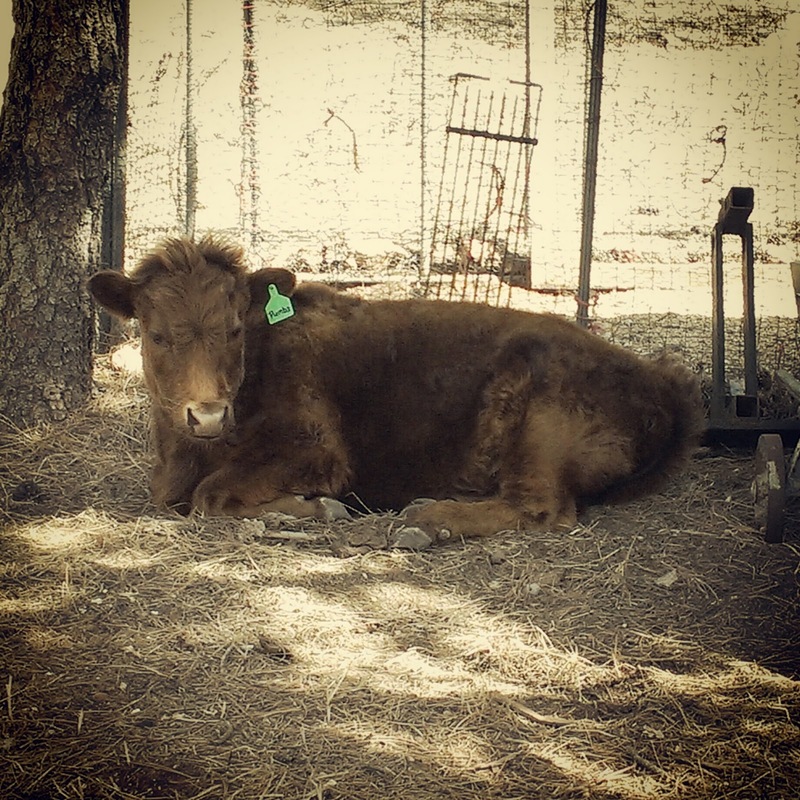 Below he is chewing his cud behind the chicken coop. Of course his presence puts the birds into a thither and I can hear the ruckus from the house. 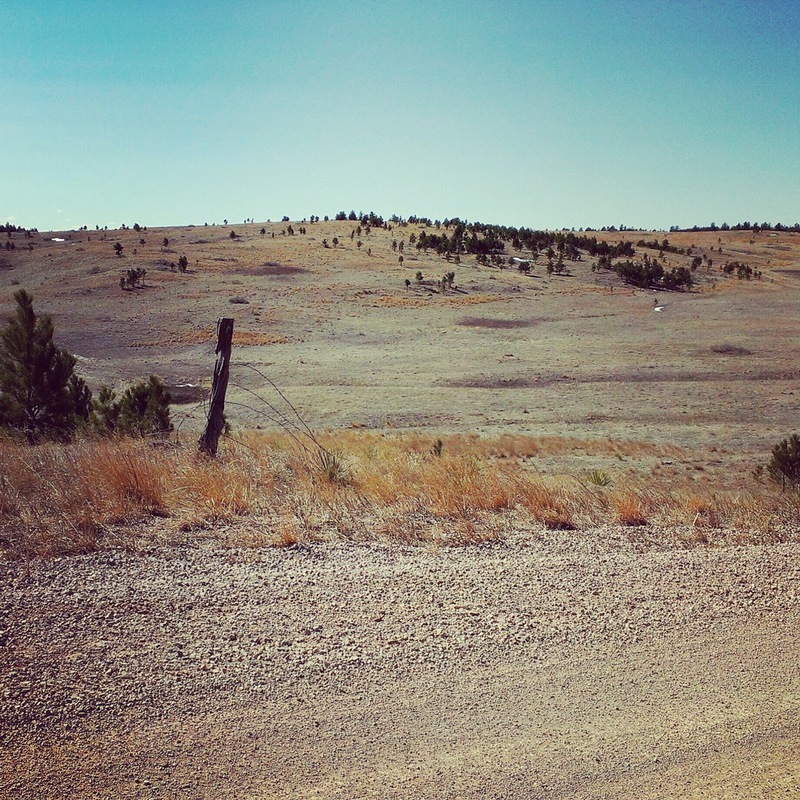 One of my routes into town consists of 13 miles of gravel. 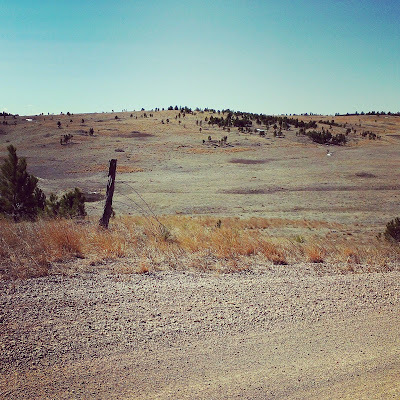 It winds through the National Forest and has some beautiful views. A lot of like minded people live along this road, and it's fun to see all the gardens, sheep, cattle, horses, and bee hives. I really need to make friends with some of these people and possibly start a barter group. Enjoy your Sunday afternoon my friends!